The U.S.-Korea NextGen Scholars Program is an initiative by CSIS Korea Chair and USC Korean Studies Institute with support from The Korea Foundation to help mentor the next generation of Korea specialists in the United States. Eleven 2018-2019 NextGen Scholars were selected in June 2018 to participate in the 2018-2019 U.S.-Korea NextGen Scholars Program. These scholars were selected in a national competition. The awardees all displayed exemplary scholarship in wide-ranging disciplines, from political science, communication, Korean history, international relations, and education, to networking and security. The purpose of the NextGen program is to help emerging scholars with an interest in Korean studies to develop public policy skills as they are called upon to provide commentary and expertise on issues related to Korea. The Scholars will participate as a group in three sets of programs: 1) Washington D.C. for briefings with policymakers in the U.S. government; 2) Los Angeles for academic mentoring and media training; 3) Seoul for briefings with policymakers and exposure to media and opinion leaders. The Los Angeles Program was held at the University of Southern California from March 13 to March 15, 2019. The theme of the Los Angeles Program is academic professionalization and media training. The NextGen Scholars participated in writing workshops for their op-eds with Mr. Evan Ramstad (journalist at the Minneapolis Star Tribune), Dr. Bridget Coggins of University of California, Santa Barbara, and program chairs Dr. Victor Cha of Georgetown and Dr. David Kang of USC. They also underwent media training and film taping of the “Korea Questions” videos at both the Annenberg School for Communication and Journalism and the Ahn House. The scholars participated in professionalization sessions on publishing and interviewing, and also met with the Consul General of the ROK in Los Angeles for a dinner on U.S.-ROK relations. As part of the U.S.-Korea NextGen Scholars program, our eleven scholars will publish an op-ed as part of the program. These op-eds were workshopped at the Los Angeles Program, with feedback provided by the program chairs and the Senior Advisory Board throughout the program. Katrin Katz, “When Tokyo and Seoul Fight, a Complacent Washington Loses”, The Diplomat, March 26, 2019. In this article, Dr. Katz argues that conflicts between South Korea and Japan plays into the hands of North Korea and China, and while U.S.’ mediation this time around may not reap immediate success, the costs of complacency are certain. Stephanie Kim, “The US admissions scandal shows that perceptions of opportunity are narrowing,” Times Higher Education, March 28, 2019. In this article, Dr. Kim argues that if Americans lose faith in alternative routes to success, entry to top universities could become as cut-throat as it is in South Korea. Benjamin Young, “Why the Second Summit Between Donald Trump and Kim Jong Un Failed,” History News Network, April 7, 2019. In this article, Dr. Young explains why the Hanoi Summit was a failure whilst urging that the autocratic nature of the Kim regime and human rights issues not to be forgotten, despite the friendlier atmosphere of the U.S. – North Korea relations today. Tom Le, “America's New Danger Zone: Divisions with Japan Could Wreck Negotiations with North Korea,” The National Interest, April 9, 2019. In this article, Dr. Le argues that Pyongyang has succeeded in weakening relations between the Washington and its allies. The Washington Program took place in Washington, D.C. from December 5 to December 7, 2018. The Washington Program was the first opportunity for the eleven scholars to meet each other. The three-day program consisted of workshops, field visits, presentations and networking meals. They met with policymakers, academics, and journalists. 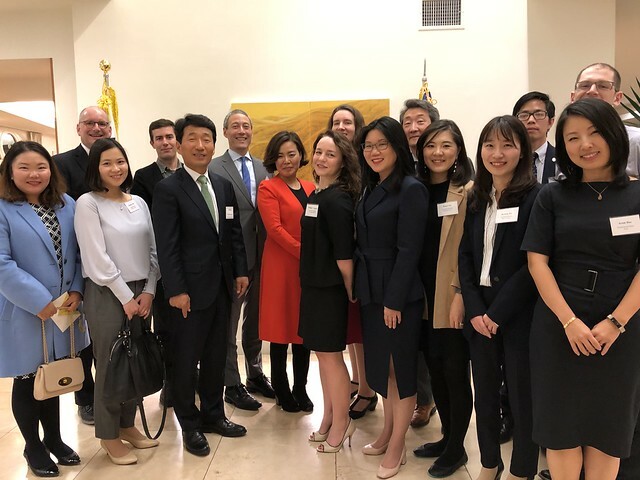 The goal of the program was to introduce the scholars to the workings of Washington, which was accomplished through presentations by Korea experts, current and former government officials, and field visits to government departments and Congress. This is a unique two-year program (non-resident) that provides opportunities for mid-career Korea specialists to discuss issues of importance to U.S.-Korea relations with policymakers, government officials, and opinion leaders in Korea and the United States, learn how to effectively engage with the media, participate in the policymaking process, gain experience as public intellectuals helping to bridge the scholarly and policy communities, and address issues of importance to the U.S.-Korea relationship. The NextGen Scholars will be mentored by two renowned Korea specialists, program chairs Dr. Victor Cha of CSIS and Georgetown University and Dr. David Kang of the University of Southern California. The program will be further supported by senior advisory board made up of a distinguished group of American and Korean advisers with vast experience in academia, government, and the private sector. The 2018-2019 NextGen Scholars program will achieve deeper and more vigorous dialogue and research on topics of immediate concern to the bilateral U.S.- Korea relationship as well as a range of issues that affect the two countries. A core objective of the program is to identify, nurture, and build a community of American public intellectuals across a wide range of sectors and facilitate policy-oriented research teams and projects. Create a network of mid-career Korea specialists with diverse backgrounds and experiences who will make long-term contributions to the U.S.-Korea relationship. Help Korea specialists become more relevant to the policymaking process. Increase the visibility of young Korea specialists and provide opportunities for engagement with policymakers and the private sector. Encourage new Korea-related research and projects and collaboration among participants. NextGen Scholars will author an op-ed and film a video lecture (Korea Questions) as part of the program graduation.